Nine men, including Wayne Rooney's father, who were arrested in a probe into betting irregularities have been released on bail. Wayne Rooney Sr and seven other men had been held at addresses in Merseyside. 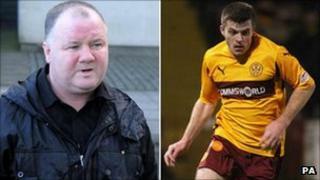 Motherwell FC player Steve Jennings had been arrested at his home in Glasgow. Police said the men had been arrested for conspiracy to defraud. The probe relates to alleged betting irregularities surrounding a game between Motherwell and Hearts. Concerns about the game, on 14 December 2010, were raised by the Association of British Bookmakers after a number of bets from the Liverpool area were placed on there being a sending off. During the match Jennings, who had already been booked, was shown a straight red card for foul and abusive language aimed at referee Stevie O'Reilly late in the 2-1 home defeat. The 26-year-old, who is from Liverpool and joined Motherwell from Tranmere two years ago, has denied any wrongdoing. It is believed that Manchester United and England striker Rooney's uncle Richie, 54, was also among those detained. Stewart Regan, SFA chief executive, said: "While the investigation involves several other individuals outwith Scotland, it is important to stress that the evidence gathered throughout this thorough period of investigation has involved only one Scottish match. "Motherwell FC are aware of the situation and will issue a response in due course." In a statement, Merseyside Police said: "Detectives have today executed warrants at 10 addresses across Merseyside and Glasgow and arrested nine men as part of an investigation into suspicious betting activity. "The arrests are the culmination of a joint operation with the Gambling Commission and the nine who have been arrested for conspiracy to defraud are being interviewed by detectives. "Those arrested are a 29-year-old from Bootle, a 48-year-old from West Derby, a 54-year-old from Norris Green, a 26-year-old from Croxteth, a 22-year-old from Kirkdale, a 31-year-old from Litherland, a 68-year-old from Fazakerley, a 36-year-old from Kirkby and a 26-year-old from Glasgow. "The investigation relates to a match between Motherwell and Hearts on December 14 2010."